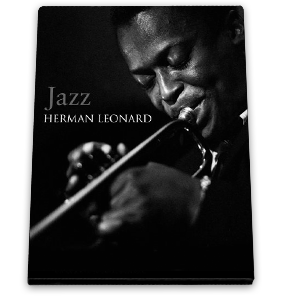 Listen: Herman Leonard and His World of Jazz, a new Platinum Series title which includes more than 60 iconic photographs of Jazz greats and 12 signed platinum prints. 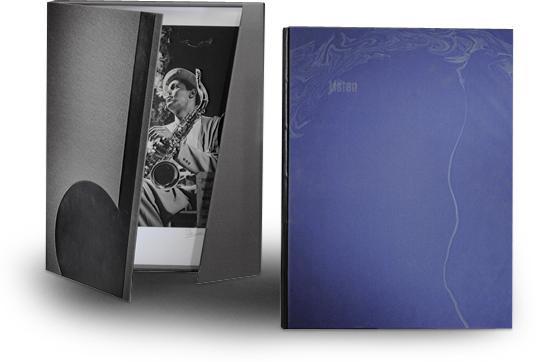 The book, bound in Japanese marbled silk and goatskin leather, is signed by Herman Leonard, Quincy Jones (Introduction). 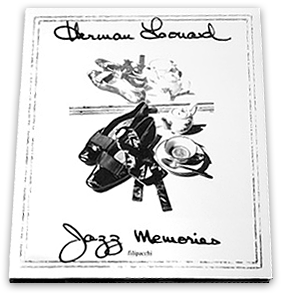 This premium quality, oversized coffee table book included Herman Leonard’s finest Jazz photography. A rare find, not distributed by book stores in the United States. The book was published in France and has French text, but Leonard's handwritten notes are displayed also in English. Featured inside are brilliant, intimate portraits of the greats of the postwar American Jazz scene. Included are sections on Ella Fitzgerald, the Modern Jazz Quartet, Art Tatum, Charlie Parker, Chet Baker, Count Basie, Dexter Gordon, Dinah Washington, Dizzy Gillespie, Duke Ellington, Frank Sinatra, Nat King Cole, Billie Holliday, Lena Horne, Miles Davis, Lester Young, Quincy Jones, Ray Brown, Louis Armstrong, Sarah Vaughan, Stan Getz, Thelonious Monk, Errol Garner, Tony Bennett and dozens more. This beautiful book, boldly personalized by Mr. Leonard, makes a wonderful gift for any Jazz lover. 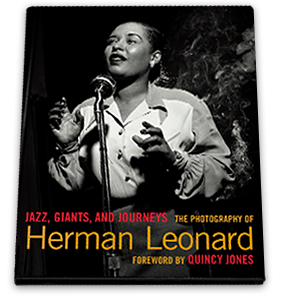 The first book on Leonard's full body of work, including portraits of Billie Holliday, Tony Bennett, Quincy Jones and Frank Sinatra. With a camera as his backstage pass, Herman Leonard has photographed the giants of jazz in their golden age, movie stars on set and on their travels to exotic places, the fashion world of Paris in the 1960s, and the inner sanctums of his beloved New Orleans. His friendships with the jazz greats, moments at Harlem and Paris jazz clubs, and colorful life enabled him to document the lives of the cultural icons of his day, with such rare images as Marilyn Monroe on an elephant in the circus, to Albert Einstein at his desk. This exquisite book is the first full treatment of this extraordinary life and distinctive body of work, giving Leonard's photographs the artistic recognition that they deserve. By K. Heather Pinson. Album covers, magazines, books, photographs, posters, and other visual extensions of popular culture formed the commonly held image of the jazz player. Through assimilation, there emerged a generalized composite of how mainstream jazz looked and sounded. 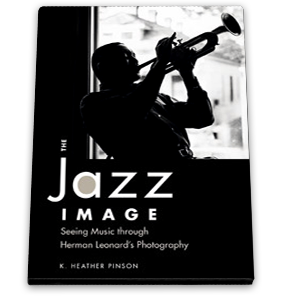 Pinson evaluates representations of jazz musicians from 1945 to 1959, concentrating on the seminal role played by Herman Leonard (b. 1923). Leonard's photographic depictions of African American jazz musicians in New York not only created a visual template of a black musician of the 1950s, but also became the standard configuration of the music's neoclassical sound today. To discover how the image of the musician affected mainstream jazz, Pinson examines readings from critics, musicians, and educators, as well as interviews, musical scores, recordings, transcriptions, liner notes, and oral narratives. For this definitive collection of his work, Leonard has retrieved scores of previously unseen photographs, published here for the first time, alongside his most famous and widely recognized images. Accompanied by an essay exploring the stories behind the pictures, and an interview with Leonard revealing his techniques, Jazz captures and preserves the glory days of the music that has been called "the sound of surprise."